Sauterelle is a D&D restaurant located in The Royal Exchange at Bank. A beautiful, historical courtyard building, the shopping centre is split into several levels. On the ground floor are shops which run along its perimeter with a café/bar in the centre of the courtyard to be found. Sauterelle itself is located on the mezzanine level overlooking the ground floor café and shops. There’s no doubting that the building is impressive, and the restaurant is nicely done, but the blue fabric seating downgrades its look from super-chic to corporate. I was recently invited to preview the Valentine’s Day dinner at Sauterelle, and while I could imagine myself choosing to come here for a business or a shopping lunch with the girls, it’s probably not a venue I would choose for Valentine’s given its location in a shopping centre. The Valentine’s menu is a three course menu (two choices per course) for £50. 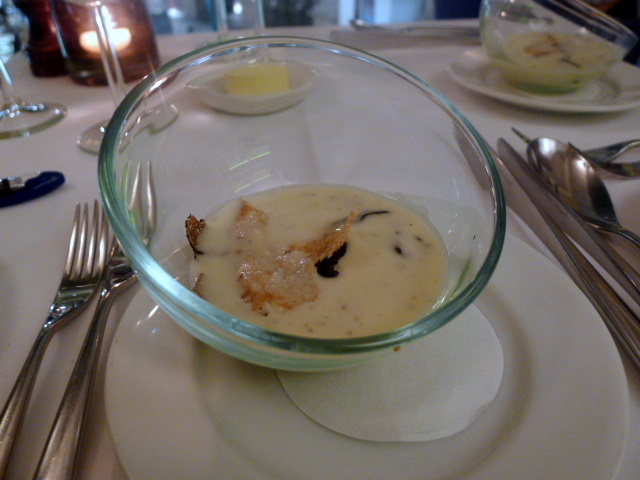 An amuse bouche of Yukon gold potato viccisoux (Sauterelle’s spelling, not mine), sourdough croutons and perigord truffle cream was tasty but a little salty. There was a nice flavour coming through from the truffle cream, but you couldn’t taste any crunchiness from the croutons. A starter of Cornish crab raviolo was very well made and delicious. 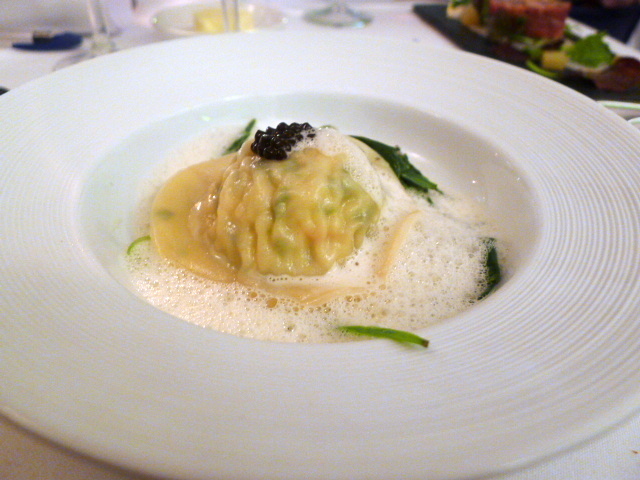 The raviolo was plump and rich with the flavour of crab, and the pasta was cooked al dente. It was finished with cucumber, samphire and lemon grass, the combination of which was a little salty. But the flavour of the lemon grass added a nice zing and freshness to the dish. 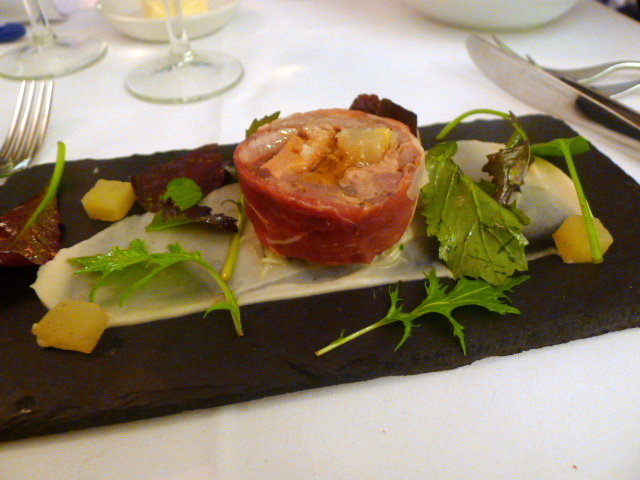 A Gressingham duck ballotine was very over seasoned, its saltiness heightened by the fact that it was rolled in pancetta. Furthermore, the duck tasted greasy rather than rich. It was accompanied by some finely chopped celeriac remoulade and spiced prune. The remoulade was a little too tangy and could have been creamier, and I would have preferred the celeriac to have been cut thicker for more texture. A pre-main of Sussex beetroot salad (whole and pureed), fresh goat’s curd, goat’s cheese and roasted hazelnuts was really lovely. 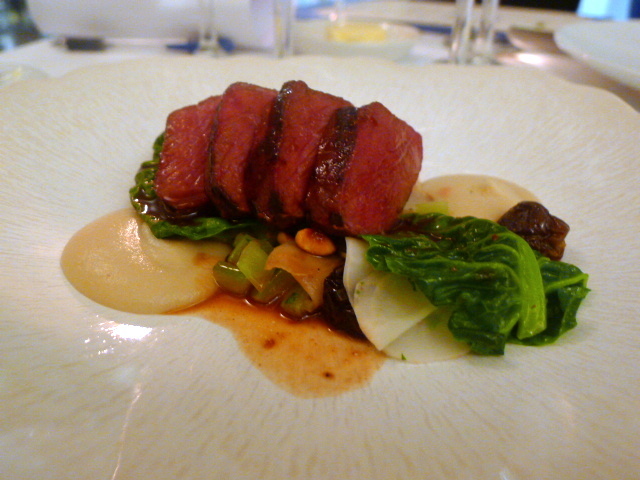 A classic combination of flavours, this was a nicely balanced dish. The accompanying leaves were very fresh and crispy. 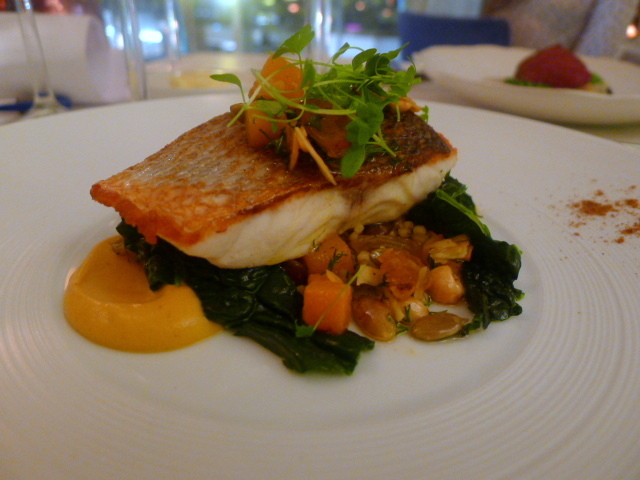 Line-caught sea bass was nicely cooked and came with butternut squash purée, bulgur wheat, toasted pumpkin seeds and a pickled sultana dressing which produced a delightful combination of textural contrasts. This was a cleverly designed dish. A roast venison saddle came out medium pink and was tender and gamey. It was accompanied by a wonderful Jerusalem artichoke purée, hazelnut crumbs for a lovely bit of crunch and roasting juices. This was a nice, accomplished dish. 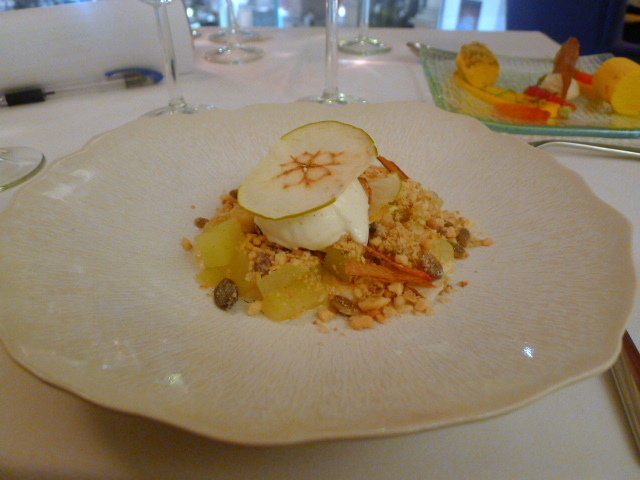 Granny Smith apple and roasted nut “muesli” with dried cranberries and vanilla ice cream was pleasant but unspectacular. I couldn’t necessarily fault the execution of this dish, but I found it uninspired for it was basically bits of apple, muesli and ice cream. There was a lot of bite to the apple, and I would have preferred a more caramelised effect for something a little softer and sweeter. 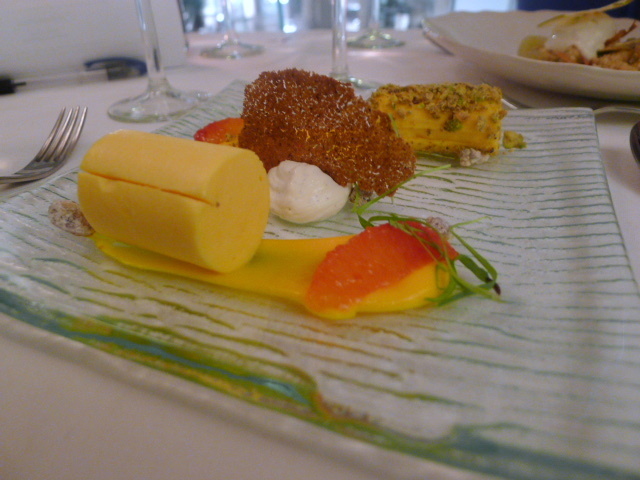 Iced carrot and orange parfait tasted a little odd as it had a slightly soapy aftertaste, but the accompanying vanilla mascarpone, ginger crisps and blood orange salad was lovely. The presentation was also very pretty. Our service was very attentive and lovely, and our waiter/sommelier was exceptionally charming. However JK, who got to Sauterelle before me, recounts an incident where the receptionist was snooty to the two people who arrived just as she got to the restaurant. This was not an evenly played out meal. There were some seasoning issues at the beginning, which then led to a crescendo of a lovely beetroot salad and excellently executed mains, but which then climaxed with passable desserts. 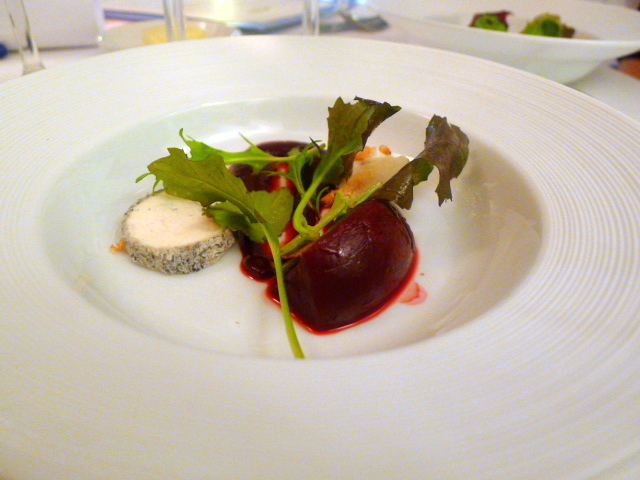 But overall, the food at Sauterelle was rather enjoyable. It’s not quite as fine dining as the best of the rest, and its setting means that I think of it more as a corporate dining venue. It’s a great lunch place or after work venue, but it’s probably not quite the destination restaurant for me. Price range: This Valentine’s Day menu is £50. A la carte is £32 – £46 for three courses. Sauterelle also offers a 2 Course and a 3 Course set menu for £20.00 and £23.50, respectively, for both lunch and dinner. Excludes drinks and service. Another great review. This place is directly behind where I work. I’ve wondered several times whether it would be any good, as the location is a little unusual, and I generally take the view that the banker-targeted places won’t live up to my expectations. Sounds like a slightly mixed bag, but better than I would have imagined. As a side note, next time you’re there, you have to pop into Paul Young’s just on the outside of the Mall and try one of their Chocolate Brownies! To die for! Yes I’ve heard of Paul Young and his chocolates. Thanks for the tip. Will most certainly try his chocolate brownies at some point. Yum. I will have to add the salted caramel to my ‘to try’ list! So many good things to eat! Thanks for the lovely compliment. So glad you like my blog.